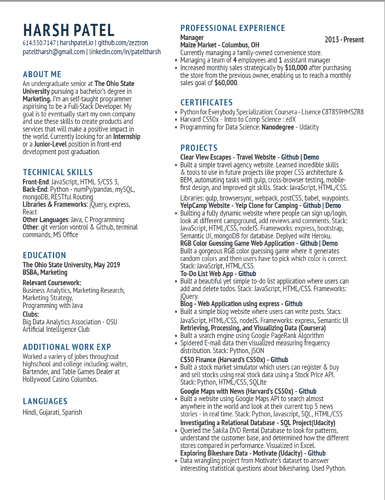 Hey guys, I’m new to this community and I’ve been working hard on gaining skills to land a junior web developer job. I’ve been trying to apply to intern/entry level positions, but still reach no success. I was hoping to get constructive feedback on my resume to see what I can improve on. Not actually a dev, but used to interview people. I’ll be brief. The biggest thing is typos. Coding is a detail-oriented skill and scanning your resume, I see at least 3 typos (ex. “jobes” at the bottom of the left column instead of “jobs”). Have multiple people review it for spelling/grammar. Shorten your descriptions on your projects to one phrase or sentence or get rid of them altogether. The description after the dash is sufficient enough and then just list the stack/technologies. Remove a few of your projects and add a touch of spacing between all the lines on the page. I like the design of it though! Thank you for the input! Getting rid of the descriptions would be great to add some more breathing room. Lisence should say License (under the Coursera listing if you decided to keep it). Looking at the “thumbnail” of your resume, the first thing I noticed was that you have a lot of text. Probably too much. You should delete as much as you can, and let it “breathe” more. Also you should be using standard 1" margins. The split-column layout isn’t a good idea to do, as most companies use ATS software, which scans only top-down and not left-to-right—i.e., your entire right column could be missed completely by such companies. If you’re looking for a traditional job at a company, you shouldn’t be saying that your goal is to start your own company. That’s a bad thing to say, and could be an immediate turn-off for anyone who looks at your resume. It sends the message that you won’t be committed to a job at a company that might otherwise think about hiring you. No offense intended, but unfortunately your certificates from those online courses don’t mean much. The only certificates worth posting on a developer resume are ones that are widely known within the IT industry, such as A+, CompTIA, MCSE, Cisco, AWS, etc. Certificates issued from online courses should really be considered only for your own personal benefit, and most aren’t worth anything. If you completed that Udacity nanodegree, move it to your Education section. The others should be deleted. Most hiring people won’t care about which tech stack you used on individual projects, and it’s not often when you’re going to have a developer look at your resume. So you don’t need to explicitly specify your tech stack on each project, that just takes up space. When you’re describing your projects, you should also put them in “business” terms, as in what they help a business accomplish. Not in terms that you’d describe to another developer. Most people reading your resume will be non-technical hiring people, and your resume should not only make sense to them but also impress them. It seems like you already understand how to do that from the way you provided specific monetary amounts in your Experience—keep doing that sort of thing when describing your projects. Avoid listing projects that you did as part of online courses, as those projects tend to involve replicating the instructor’s code, and don’t show your originality at all. Only list projects that are the most impressive, and ones that you did either yourself or with a team. You don’t need to link to individual GitHub repos for your projects, when you already have a link to your main GitHub profile. The only link that really matters on individual projects is one where a user can interact with an app—i.e., a deployed version on Heroku or Netlify, for example. I went to your portfolio website and couldnt find anything but just links to your codepen, github, and email. Am I missing something or is that how its supposed to be? For now it’s just those links. I’m still in the process of adding all my projects to my site. I’ll have them there though. I reformatted the resume to make it look cleaner so it’s not cluttered with text. Got rid of the certificates section. Maybe will add a AWS cloud certificate when I eventually get one.